Copy File Path to the clipboard : Copy the path of the selected file to the clipboard. Copy Full FileName to the clipboard : Copy the full file-name (Path + Name) of the selected file to the clipboard. Copy FileName using URL format to the clipboard : Copy the full file-name (Path + Name) of the selected file to the clipboard using the Internet Path format Copy FileName using UNC format to the clipboard : Copy the full file-name (Path + Name) of the selected file to the clipboard UNC format Copy file content to the clipboard : Copy the content of the selected file to the clipboard. Open In Notepad : Open the selected file in the notepad editor. Open In Default text file editor : Open the selected file in the default text editor installed. Open In associated text editor : Open the selected file in the associated text editor. Open Command Line here : Open the cmd.exe application in the folder of the selected file. Open Command Line here as Administrator : Open the cmd.exe application in the folder of the selected file as Administrator. Copy File Path to the clipboard : Copy the path of the selected file to the clipboard. Copy Full FileName to the clipboard : Copy the full file-name (Path + Name) of the selected file to the clipboard. Copy file content to the clipboard : Copy the content of the selected file to the clipboard. Open In Notepad : Open the selected file in the notepad editor. Open In Default text file editor : Open the selected file in the default text editor installed. Open In associated text editor : Open the selected file in the associated text editor. Open Command Line here : Open the cmd.exe application in the folder of the selected file. Open Command Line here as Administrator : Open the cmd.exe application in the folder of the selected file as Administrator. 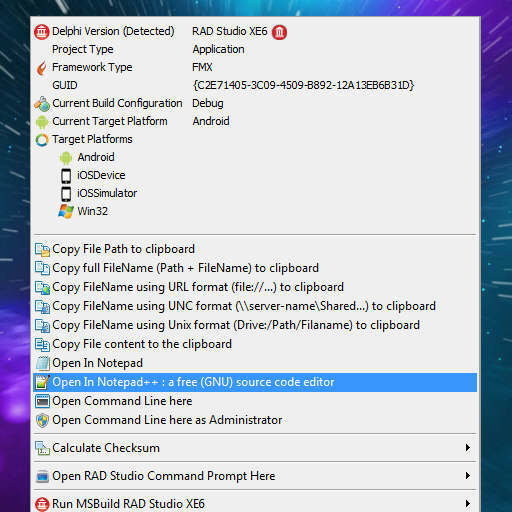 Head over and download the free Delphi Dev Shell Tools utility for Windows and start increasing your productivity.